For shiatsu for people course dates, please go to our Course Calendar page, here. Today’s pace of life creates many demands and pressures both physically and emotionally, in order to be at our best and to be successful, maintaining a good level of fitness is important to support these demands and to keep your body strong and supple. However these demands and pressures ask a lot of our muscles, tendons, ligaments and bones and when any of these has a slight difficulty in functioning to it’s maximum potential, the body struggles to operate correctly physically and emotionally resulting in the body becoming unbalanced. When this takes place it then affects the way we think and quite often results in becoming down and even depressed. “ I suffered for many years and over those years I tried several types of shiatsu to help me, but I have to say I was gob smacked at the results this one gave me." i-atsu(TM) is a style of shiatsu developed by Jacqueline Molony for people only - a form of acupressure, a sister therapy to acupuncture. Instead of needles we use our hands, using pressures, stretches and articulations to bring about beneficial changes. The touch is gentle using only our own natural body weight for pressure. It takes many muscles working together to produce a supple, balanced movement in our body. The flexor muscles contract to make our joints articulate. The joint is then straightened by contraction of the corresponding extensor muscles. The abductor muscles carry the limb away from the mid-line of the body whilst the adductor muscles bring the limb towards the body. From this you can see how everything works in partnership and balance to bring about successful movement. i-atsu is profound at putting the elasticity into the muscles and re-balancing the body as a whole physically, emotionally and mentally. It alleviates muscle soreness and deterioration, pain and stiffness – so preventing muscle, ligament and tendon problems. Our bodies have a natural source of energy that flows along pathways called ‘Meridian’ lines, which relate to all major organ functions. The Meridians run from muscle to organ and vice versa. If the Meridian becomes damaged either by accident, birth, over work or just general wear and tear, then the energy flow will become weak or non existent. This is repaired by gently stimulating the body’s natural healing ability, stretching the Meridian lines, pressing the energy points and helping the body to become aware of its own imbalances physically, emotionally and mentally. Becky showing a brave face taken before and then after one treatment of i-atsu. You will notice the difference in the height between her hips and her arms as well as the fact that her shoulders are becoming more even. What are the benefits of i-atsu? 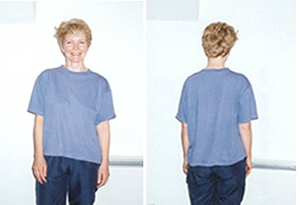 Among the many benefits are: early recognition and treatment of problems before they escalate: treatment and elimination of musculo-skelatal problems such as chronic and subtle diseases to include stiffness, maintaining suppleness, reducing susceptibility to injury, maximising physical potential, activating the immune system, stimulating circulation, the nervous system and the release of hormones, including endorphins, the body’s own natural painkiller, alleviating emotional problems such as stress and depression. What sort of conditions can i-atsu help with? i-atsu can help with and in many cases alleviate a vast majority of the common conditions as seen today. For those who have found i-atsu changing their condition and life they all came with one thing in common – they all wanted to get better. They all wanted to change their lives forever, they wanted to do the things they used to be able to do, they wanted to rediscover the person they once were. To know if i-atsu can help you Jacqueline recommends trying just one treatment, in just one treatment Jacqueline will be able to let you know if the problem you have can be alleviated. Click here to have a look at the many conditions that i-atsu has given relief to. For personal success stories with i-atsu(TM) go to the case studies page. For photos of shiatsu at work, click here. To book a treatment call 01547 530871 / 07721 739973 Email: shiatsu-for-people-horses-dogs@hotmail.com or should you wish to learn this profound work please refer to the courses page.